Is there a garment more "all American" than jeans? Off the top of my head, I can't think of one. And yet, after turning 50, I started wearing jeans less and less. Being short, I've never found the loose-fitting jeans very flattering. And being old-er, I felt uncomfortable wearing jeans that were form-fitting. In recent months, however, two things have got me thinking differently about jeans. First, in a recent interview, Iris Apfel, 92, said she lives in jeans during the daylight hours. And though she is taller and slimmer than I am, I thought: "If jeans are good enough for Iris, they're good enough for me." 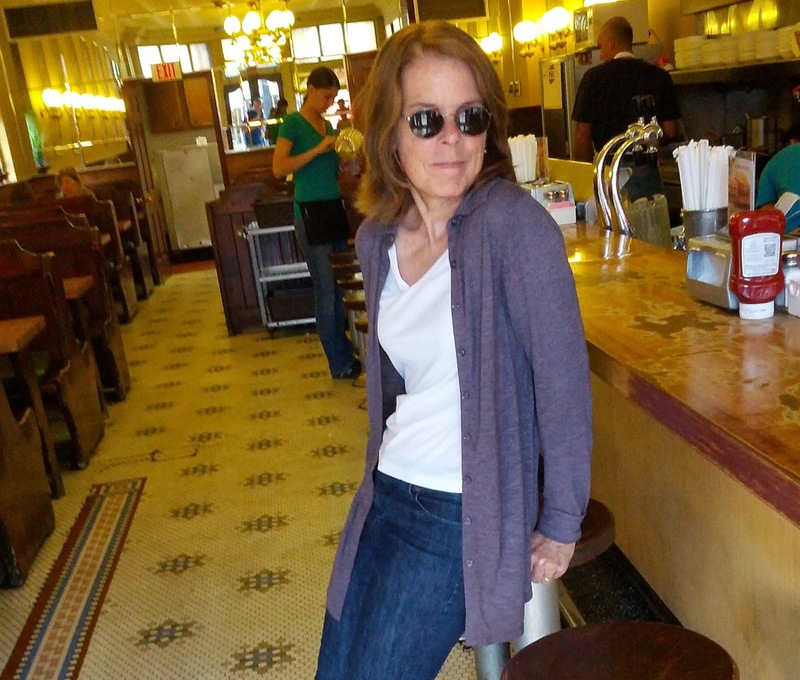 And secondly, I'm feeling very comfortable in this season's ultra-lightweight long cardigan and jeans. Here's how I'm styling my jeans with long cardigans. And for a few shopping sources for longer sweaters, scroll down. Covers my bottom, hips and upper thighs without consuming my petite frame. This fall I'm seeing thin, long sweaters in a variety of colors and styles, including trendy color-blocked designs. Always the practical one (too practical? ), I've gravitated to the neutral colors, which are super easy to mix with the rest of my wardrobe. Last weekend, while my husband was getting our sailboat ready for winter storage, I ran out to our favorite soda shop and got milkshakes for us (above). 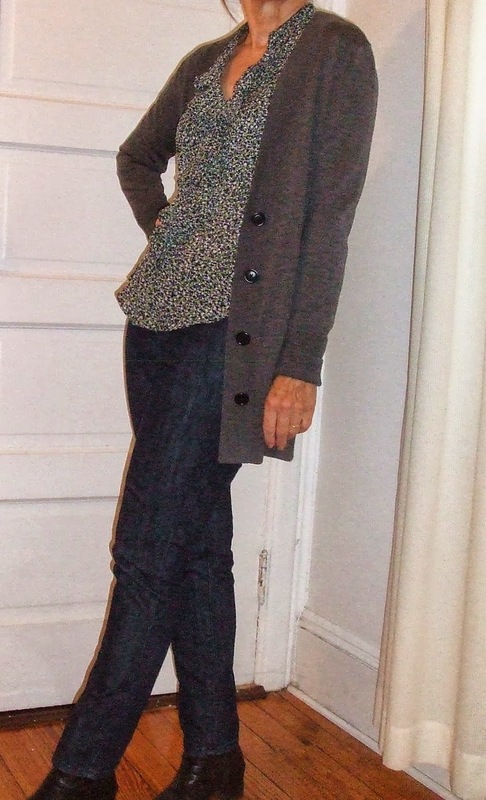 I love long cardigans with a little collar, like my lavender cardigan (Coldwater Creek). Black and blue is one of my favorite color combinations. So...when I wear a blue and white striped tee with jeans, I like to finish the look with a black long sweater (Ronen Chen) (below). V-neck, boyfriend sweaters have been popular for a several years. To avoid looking too frumpy or dumpy, I like to pair my boyfriend sweater with a feminine top, scarf or necklace. My top (below) has ruffles, which is so two years ago. But I still like it, so why not? Bonnie Raitt has been wearing tops with ruffles forever. Go Bonnie!